New Delhi, March 24, 2017: Prateek Dwivedi, a serial entrepreneur, lifestyle affiliate marketer, and founder of Europe-based ‘AdBooba’, is eyeing to expand company’s footprints in India. 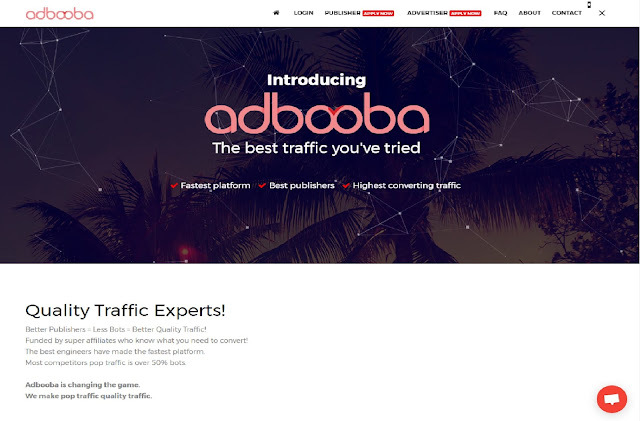 AdBooba is a unique platform for traffic generation and management system to help in advertisers in driving more traffic to their sites via various channels such as pop-ups, social media pages, and more. AdBooba is providing real-time stats, smart geo-targeting options, conversion tracking, URL tracking tokens, and all the advanced options needed for setting up and running a profitable campaign. It also enables advertisers to blacklist a certain publisher/traffic source that isn’t converting well. “Affiliate marketing is an art, and once you master it, you can really grow leaps and bounds. Having said that, there’s a lot of money to be invested on paid ads, and learning how to create a sales funnel, and convert your visitors into sales isn’t an easy job to say the least. Back in those days, I’ve seen some miracles of 5 figures a night, but on certain occasions, lot of my money has gone down the drain in crappy campaigns as well - so it’s all about finding the balance to run and sustain a profitable CPA campaign” says Prateek Dwivedi, Founder of AdBooba. At present, Prateek is also working on some private contract-based assignment in Bollywood industry, and is further looking to expand his client base in India, as well as other parts of the globe in 2017. During his current trip of about two months in India, Prateek would be meeting young aspiring Internet marketers, affiliate marketers, blogging and startup enthusiasts in the country and addressing them at various events including as Desi Bloggers World Meetup during April in Delhi and Mumbai, and even visiting a few colleges in and around Mumbai. AdBooba, has emerged as one of the fastest platforms for driving targeted traffic for publishers, delivering over 5 Billion impressions, and 100M impressions, resulting in over 10k conversions, across 16 countries so far. Being an Indian by origin, once Prateek started making some money with CPA offers, he soon explored various options available in Internet marketing field, and expanded his horizons, and after gaining years of experience in the field, he finally launched “AdBooba”. Over the years, Prateek has been exploring various opportunities to make money through Internet Marketing, and has evolved as a specialist in driving various forms of traffic for publishers.